Ferrari's Kimi Raikkonen during practice. Ferrari's Kimi Raikkonen set the fastest practice time for the Singapore Grand Prix on Friday but the Finn's team mate Sebastian Vettel suffered a frustrating start to the weekend in his bid to overhaul championship leader Lewis Hamilton. Vettel has been criticised for dropping points due to some poor tactical driving this season but there was little he could do looking on from the Ferrari garage after his car suffered a radiator fluid leak midway through the second practice session. Vettel's troubles began during the frantic middle sector of the second session as drivers looked to set their fastest laps on the high-grip hypersoft tyres before switching to slower compounds for race simulations. The German was on course to challenge Raikkonen and Hamilton's best times before he clipped the wall on the final bend, causing him to abort his lap and dart into the pits with a fluid leak. He sat out the remainder of the session. Valtteri Bottas was fifth fastest in the second Mercedes, ahead of Renault's Carlos Sainz, Haas' Romain Grosjean, McLaren's Fernando Alonso and Vettel down in ninth place after completing just 12 laps. The demanding 23-turn circuit has traditionally favoured the Red Bulls and Ferraris, so it was no surprise to see Vettel and Raikkonen clock the next quickest times as Mercedes opted to concentrate on long runs instead of qualifying simulations. "We can recover most of it tomorrow so we are not that worried," Vettel told Sky Sports. "It looks like being close but we won't really know until Sunday." 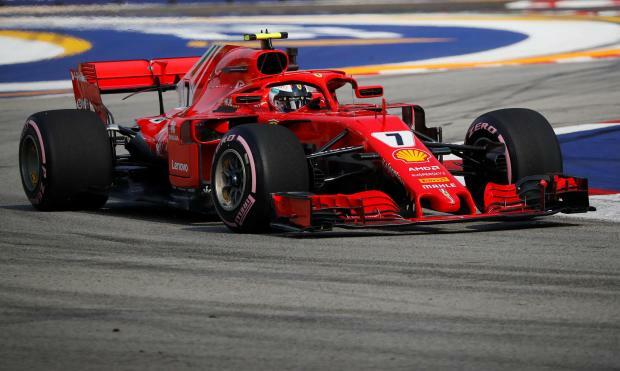 Sauber's Charles Leclerc continued to show the sort of form that encouraged Ferrari to sign him as Raikkonen's replacement for next season by finishing ninth in an opening session that ended on a sour note when he crashed into a wall at Turn 13. The 20-year-old apologised to his team on the radio as he left his car stranded in an escape road with two minutes left in the session, a sight that will disappoint his future employers, who will hope he does not make similar mistakes next season.